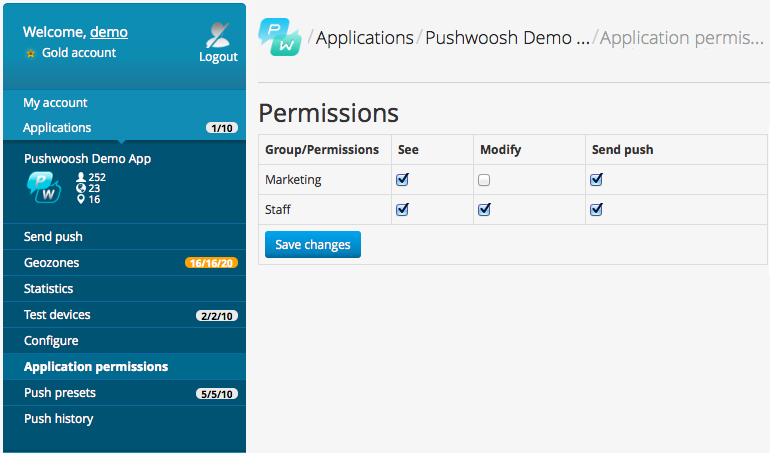 As an Account owner, you can invite other Pushwoosh users to access your account and work together. Let us have a closer look at Users and Groups option. We advise you to decide who you are going to invite to your account and why. For instance, you have three developers on your team responsible for configuring new apps, testing and supporting these apps. Instead of distributing your master username/password among your team members you can create a User Group called “Staff” or “Engineers” and provide full access to the content of your account. Alternatively, you already have everything up and running, and you need your Marketing team to be able to send push notifications without incidentally changing your app properties. You may also want to limit access to some of the apps that are not ready for the public access. Based on these requirements, you can create two groups, “Staff” and “Marketing” (see Figure 1). For Marketing Group we recommend leaving all Group Permissions empty. 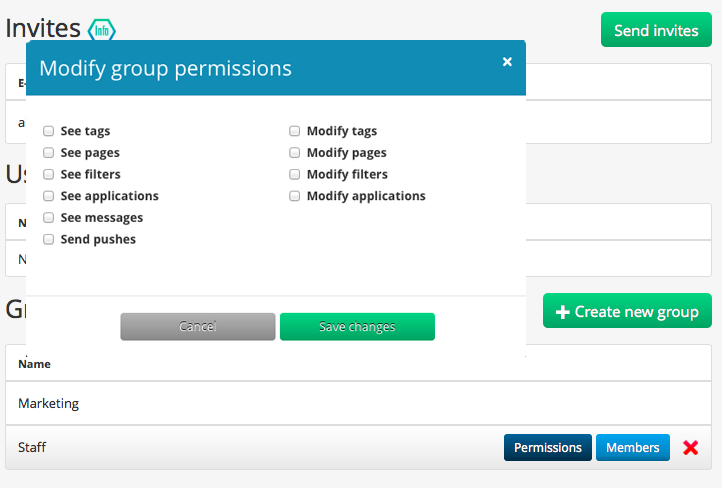 You can always change your Group Permissions in the Users and Groups page. Now you might want to tailor individual permissions for each app to make it accessible for your Marketing department. 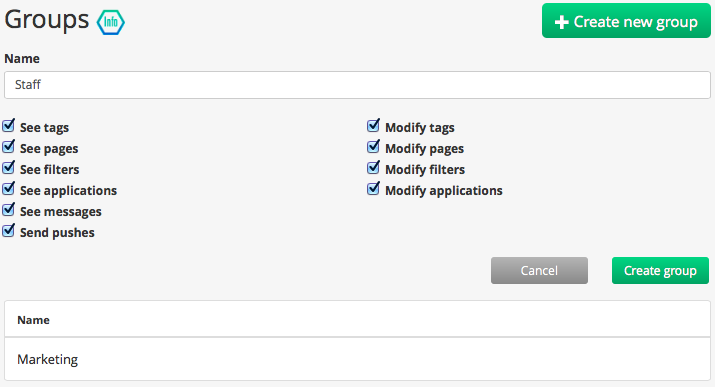 You can do that in the Application Permissions page (see Figure 3). Now your Marketing Group will see this app in the list of available applications and send push notifications on behalf of your account. 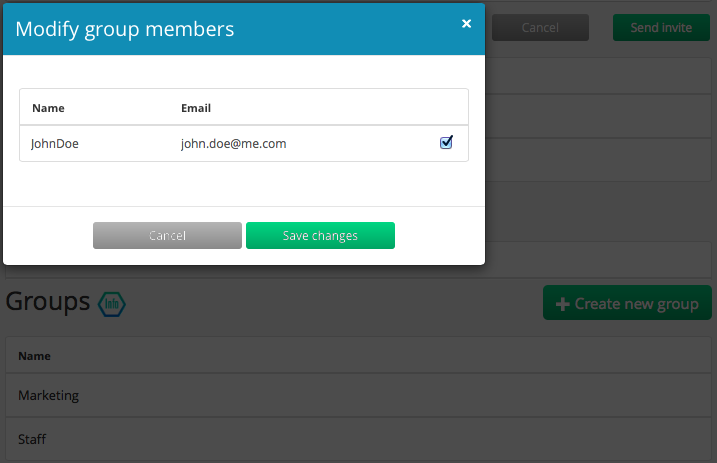 As soon as you have created your groups, you can invite new users to your account. Let’s say, you would like to invite John Doe from your Software Engineers team and Jane Doe from the Marketing team. You can do that in Users and Groups page (see Figure 4). Once these users receive the invitation email, they can accept the invite under their current Pushwoosh usernames or create a new one. Your last step will be to add these users to the corresponding groups. All you have to do is to mouse over the Group and click Members (see Figure 5). That’s it! Now you are ready to conquer the world.